"Worcester College" redirects here. 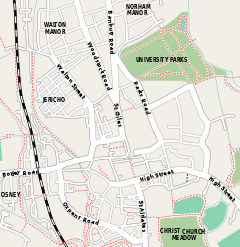 For other uses, see Worcester College (disambiguation). Worcester College /ˈwʊstər/ is one of the constituent colleges of the University of Oxford in England. The college was founded in 1714 by the benefaction of Sir Thomas Cookes, a Worcestershire baronet, with the college gaining its name from the county of Worcestershire. Its predecessor, Gloucester College, had been an institution of learning on the same site since the late 13th century until the Dissolution of the Monasteries in 1539. Founded as a men's college, Worcester has been coeducational since 1979. Blazon: Argent, two chevronels between six martlets, three, two and one gules. As of July 2016[update], Worcester College had a financial endowment of £73 million. Notable alumni of the college include the media mogul Rupert Murdoch, television producer and screenwriter Russell T Davies, US Supreme Court justice Elena Kagan, and novelist Richard Adams. The buildings are diverse, especially in the main quadrangle: looking down into the main quadrangle from the entrance through the main building, to the right is an imposing eighteenth century building in the neo-classical style; and to the left a row of medieval buildings known as "the cottages", which are among the oldest residential buildings in Oxford. These cottages are the most substantial surviving part of Gloucester College, Worcester's predecessor on the same site: this was a college for Benedictine monks, founded in 1283 and dissolved with the Dissolution of the Monasteries in about 1539. Front view of medieval cottages. After a lapse of 20 years, the buildings of the old Gloucester College were used in the foundation of Gloucester Hall, in around 1560. The penultimate principal, Benjamin Woodroffe, attempted to establish there a 'Greek College' for Greek Orthodox students to come to Oxford, part of a scheme to make ecumenical links with the Church of England. This was a going concern from 1699 to 1705, although only 15 Greeks are recorded as members. In 1714, thanks to a fortunate benefaction from a Worcestershire baronet, Sir Thomas Cookes, Gloucester Hall was transformed into Worcester College. Even then, there were only sufficient funds to rebuild the Chapel, Hall and Library and the north side of the Front Quad, known as the Terrace. The designs were by Dr. George Clarke, who had consulted Nicholas Hawksmoor. In 1736, Clarke generously left to the College his great collection of books and manuscripts. These included the papers of his father William Clarke (which are of crucial importance for the history of England during the period of the Commonwealth and Protectorate) and a large proportion of the surviving drawings of Inigo Jones. Owing to lack of funds, Worcester's eighteenth-century building programme proceeded by fits and starts. The west end of the Terrace and the Provost's Lodgings were added in 1773–76 (architect: Henry Keene). The medieval cottages were to have been replaced by a further classical range, but survived because money for this purpose was never available; the Hall and Chapel, by James Wyatt, were not completed until the 1770s. The College Chapel was built in the 18th century. Dr George Clarke, Henry Keene and James Wyatt were responsible for different stages of its lengthy construction (1720–91), owing to shortage of funds. The interior columns and pilasters, the dome and the delicate foliage plastering are all Wyatt's work. His classical interior was insufficiently emphatic for the tastes of militant Victorian churchmen, and between 1864 and 1866 the chapel was redecorated by William Burges. It is highly unusual and decorative; being predominantly pink, the pews are decorated with carved animals, including kangaroos and whales, and the walls are riotously colourful, and include frescoes of dodos and peacocks. Its stained glass windows were to have been designed by John Everett Millais, but Burges rejected his designs and entrusted the work to Henry Holiday. Oscar Wilde said of the Chapel, "As a piece of simple decorative and beautiful art it is perfect, and the windows very artistic." Worcester is unique among the Oxford colleges in that it has not one, but two chapel choirs of equal status, which share out the weekly services between them. There is a mixed-voice choir constituted of auditioned choral scholars and volunteers, which sings twice a week: weekly on Thursday and on alternating Sunday and Monday evenings. The Boys' Choir consists of trebles from Christ Church Cathedral School and alto, tenor and bass choral scholars. This choir also sings twice weekly; on Sunday and Tuesday evenings. These choirs are run on a day-to-day basis by Worcester’s three Organ Scholars alongside the Director of Music. "Exit Burges. [The college fellows] will be sorry in fifty years." —Pevsner on the College Fellows' decision to remove Burges's work in the Hall and reinstate that of Wyatt. Burges also started the redecoration of the Hall in 1877, but the work remained uncompleted at his death, and in 1966 Wyatt's designs were restored. In more recent years several new residential blocks for undergraduates and graduates have been added, thanks in part to a series of generous benefactions. The latest of these include the Earl building, Sainsbury Building (which won the Civic Trust Award in 1984), Linbury Building, Canal Building, Ruskin Lane Building (for undergraduates), and the Franks Building (for graduates). A modern addition to Worcester College, the Canal Building, sits next to the north entrance to the college and, as the name suggests, beside the Oxford Canal. It houses 50 students in large en-suite single rooms. The accommodation is usually reserved for third and fourth year undergraduates. Although Worcester is near the centre of Oxford today, it was on the edge of the city in the eighteenth century. This has proved a benefit in the long run, since it has allowed the college to retain very extensive gardens and, uniquely among Oxford colleges, contiguous playing fields (a total of 26 acres (110,000 m2), including a lake). The gardens have won numerous awards, including the Oxford in Bloom college award every time they have been entered for the competition. Extensive work on the gardens was carried out between 1817 and 1820, and they may have been laid out in the Picturesque style by Richard Greswell in 1827. They are now managed by head gardener Simon Bagnall and a team of seven gardeners. A production of Twelfth Night was directed by Patrick Garland in the gardens with Oz Clarke as Sir Toby Belch and Francis Matthews. The college's gardeners keep a blog to provide an insight into the work involved in looking after the 26 acres (110,000 m2). Every three years in June, the college hosts a commemoration ball. "Nōs miserī hominēs et egēnī, prō cibīs quōs nōbis ad corporis subsidium benignē es largītus, tibi, Deus omnipotēns, Pater cælestis, grātiās reverenter agimus; simul obsecrantēs, ut iīs sobriē, modestē atque grātē ūtāmur. Īnsuper petimus, ut cibum angelōrum, vērum panem cælestem, verbum Deī æternum, Dominum nostrum Iēsum Christum, nōbis impertiāris; utque illō mēns nostra pascātur et per carnem et sanguinem eius fovēāmur, alāmur, et corrōborēmur. Amen." "We unhappy and unworthy men do give thee most reverent thanks, Almighty God, our heavenly Father, for the victuals which thou hast bestowed on us for the sustenance of the body, at the same time beseeching thee that we may use them soberly, modestly and gratefully. And above all we beseech thee to impart to us the food of angels, the true bread of heaven, the eternal Word of God, Jesus Christ our Lord, so that the mind of each of us may feed on him and that through his flesh and blood we may be sustained, nourished and strengthened. Amen." Every Hilary (spring) term on the Saturday of 4th Week, second-year members of the College celebrate 'Midway' to mark the point at which they are exactly halfway through their degree (given that students on 3-year courses attend for nine terms, each of duration eight weeks...). The occasion is marked with the taking of professional photographs: one in formal dress (but not gowns), and the other in costumes made by the students, usually reflecting themes decided by individual groups of friends. Later in the day a meal is served in Formal Hall to distinguish the event. The unofficial motto of the college (in Latin) is "ibi solum unum Collegium Vigorniense". Worcester College is known for its sporting prowess, especially in football, cricket and hockey, and is one of the few colleges to have its sporting grounds onsite (football, rugby, tennis, basketball, netball, croquet and cricket). In the 2011/2012 season Worcester won Men's Football Cuppers, Men's Reserve Football Cuppers and Women's Football Cuppers. During recent years the hockey side has won numerous league titles, 'Varsity Cuppers' or 'Supercuppers' in 2015, and Cuppers in 2016. Fictional alumni of the college include Nick Guest from The Line of Beauty by Alan Hollinghurst. Bromsgrove School that shares a similar coat of arms, based on those of their joint benefactor, Sir Thomas Cookes of Norgrove. ^ "Worcester College Governance". Worcester College, University of Oxford. 2011. ^ a b c "College News". Worcester College Alumni Website. Worcester College, Oxford: Worcester College External Relations Office. 2010-07-05. Election of New Provost. Archived from the original on 2010-07-05. ^ "Undergraduate numbers by college 2011-12". University of Oxford. ^ "Worcester College: Annual Report and Financial Statements, 2015-16" (PDF). Governing Body, Worcester College, University of Oxford, Audited Everett & Son. ^ Tappe, E. D. (1954). "The Greek College at Oxford, 1699–1705" (PDF). Oxoniensia. XIX. pp. 92–111. ^ "Worcester College Chapel | The Chapel". Worcesterchapel.co.uk. 2014-06-20. Archived from the original on 2017-02-20. Retrieved 2017-02-19. ^ Sherwood & Pevsner 1996, p. 223. ^ Pevsner, Nikolaus; Jennifer Sherwood (1974). Oxfordshire. London: Penguin Books. ISBN 0-14-071045-0. ^ Buchan, Ursula (2007-07-20). "Borderlines: Worcester College gardens". Daily Telegraph. London. ^ Worcester College Gardeners Blog. ^ Denis Greenhill (11 April 1992). "Obituary: Sir Peter Hayman". The Independent. Retrieved 2 July 2014. Sherwood, Jennifer; Pevsner, Nikolaus (1996). Oxfordshire. The Buildings of England. Yale University Press. ISBN 978-0-300-09639-2. Wikimedia Commons has media related to Worcester College, Oxford.